but they get over it. We usually went fishing 2 or 3 times a year. We went after the corn was hoed the second time and after the hay was finished. I think Dad used the promise of a fishing trip to motivate us. When it rained in the morning and chased us out of the fields, we sometimes went fishing that afternoon. Unlike today, there was a closed season on trout. The season opened in March. It was almost like a religious holiday. Poachers tried to sneak in early. Fishermen were lined up elbow-to-elbow at favorite fishing areas. Some opening days were cold and snowy - no matter. The streams and lakes were lined with fishermen. We had a choice of four native brook trout streams. Big Run and Windy Run flow west and empty into the Tygart River. Black Run and Beaver Creek flow east and empty into Shaver’s Fork of the Cheat River. We could walk down over the hill to Windy Run, and we accessed the other three from the Beech Flat. In later years, we sometimes fished the Tygart Valley River near Elkwater. We caught chubs, suckers, sunfish, and a few small bass in the river. It was not stocked with trout as it now is. I still love to fish for those native brookies. They are truly wild trout, hatched and raised on those tiny mountain streams. They are not very big - 8 inches is bragging size. When they are biting well, catches of 50 to 60 in a day are possible. Even when they are not biting well, they can still be caught. They are the most beautiful fish in our streams. They have bright spots and stripes with almost blood red fin roots. They are extremely tasty with bright pink-orange flesh. They are very strong and active; a 7-inch brookie fights like a stocked trout twice its size. I love fishing for them, but I love being where they live even more. Compared to rainbow or brown trout, they are pretty dumb, but they make up for it by being very wild. Stepping too hard on the stream bank, stepping on a rock that slides on another rock, hitting tree limbs over the water with a rod tip, or showing any part of your body will spook them. You have to sneak up on them. You spend as much time fishing kneeling, sitting, or even lying down as you do standing. You have to work for them. They can live only in very cold water. If the sun hits a significant portion of the stream, there will be no native brookies below that area. You can fish a native brookie stream all day without seeing the sun. They need a lot of oxygen in the water. White water is the key. Falls and riffles help to keep the water oxygenated. Native brookie streams have a lot of rocks to climb over and around. They also need low Ph water. In West Virginia, that comes from limestone rocks in the stream. Limestone erodes very smooth, and when it is wet, it is very slick. I love those pristine streams. I love to just sit by the stream drinking coffee. I like to catch the little rascals, but I love being where they live. just as it did when I was a kid. 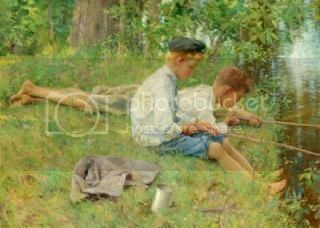 When we went fishing when I was a kid, we traveled very lightly. We each had a Prince Albert tobacco can full of garden worms. Our line with a snelled hook attached was wrapped around a small twig, the tip of the fishing pole used on the last trip. On the way down to the creek, we cut small saplings about six or seven feet long. We unwrapped the line from the twig, tied it on the new pole, and started fishing. We used a heavy black braided line, probably 30 - 40 pound test. We probably had 10 to 12 feet of line. The rest of our equipment was cloth sacks to carry the fish. Later Mason and I bought eight and one-half foot telescoping steel rods with level wind bait casting reels. They worked well; a long rod lets you drop the bait in the small pockets where the fish lie. When Sally and I go to one of those small streams now, we take so much stuff that it looks like we will be there for a week! 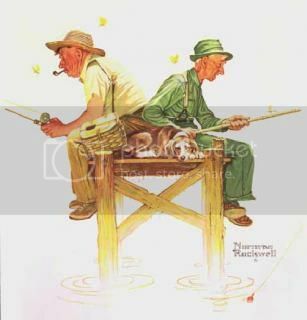 The catch I remember most vividly was what we called a water dog. It was a four-legged critter about 2 feet long, and it came out of the water with an attitude. Scared me half to death. I yelled for Dad and was even more scared when he cut my line. 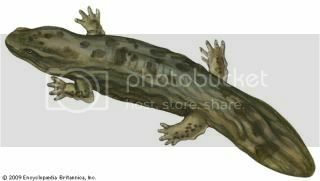 I later discovered that it was a very large species of salamander called the hellbender. It was large, ugly, and was snapping its jaws like a snapping turtle. Vernacular names include "snot otter", "devil dog", "mud-devil", "grampus", "Allegheny alligator", "mud dog", "water dog" and "leverian water newt". There are certain days that stand out in each person’s memories. Of my 25 most memorable days, at least 5 or 6 were spent on a trout stream. I have fished one particular stream with seven people who are now dead. The memories almost overwhelm me.